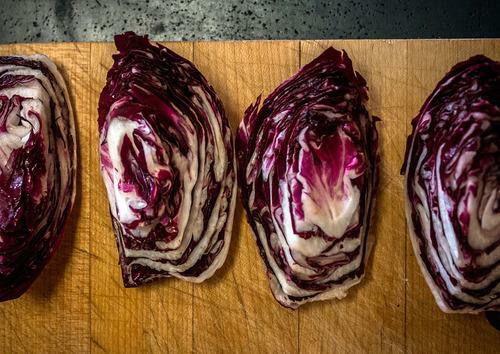 Once you go radicchio, you’ll never go back. We need to talk about something that is not called turkey, dressing, or sweet potatoes. This Thanksgiving, whether you know it or not, you will want a salad. Your body will be happy that you have a salad on the table, and I have one that is seasonal and colorful. The centerpiece of the salad is radicchio (RUH-DEE-KEE-OH—say it fast!). What do you know about this maroon orb sitting in your produce section? It is most likely ignored by you and other shoppers while broccoli, asparagus, and kale are chosen first, second, and third like the cool kids in a pick-up basketball game. Radicchio is a bitter lettuce, make no mistake, but that gives you an opportunity to work with bold flavors while doing something good for your body during this otherwise punishing eating season. Its assertiveness should be seen as a way to expand your culinary horizons. Now is when radicchio is at its best; it fully matures and gains it signature deep red color when temperatures dip into the 40s.